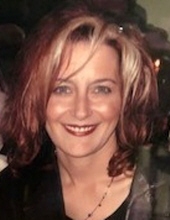 Colleen M. (Palmer) Falgiano, age 50, of Perry formerly of Wappingers Falls, NY passed away on Monday, April 8, 2019 at her home surrounded by her family. She was born in Carmel, NY on April 15, 1968 a daughter to Sharon (Cipolla) Hoerle and Leonard K. Palmer. Colleen was a receptionist and the kitchen manager for many years for Hyatt Hotel and Resort in Wappingers Falls. She then became a cosmetologist and worked for Hair Liberation in Courtland Manor, NY up until her illness. She was a member of the New Testament Church in Perry. Colleen enjoyed reading, cooking, listening to music, she loved animals especially beagles and spending time with her family and friends. She is survived by her mother: Sharon Hoerle of Perry, father: Leonard (Kathy) Palmer of Perry, sister: Christine (Brandon Brown) Cygan of Silver Lake, niece: Cassidy (Chris Revetta) Cygan of Silver Lake, her dog: Charlie, former husband and friend: Craig Falgiano of Wappinger Falls, NY, close friend: Mike DePaolo of Saratoga Springs, NY, brother-in-law: John Cygan of Castile, 2 Aunts: Martha Ross of Rochester, Virginia Palmer of New Jersey, 3 Uncles: Roy (Cheryl) Cipolla of Perry, Mike (Linda) Cipolla of Florida, James Palmer of Geneseo along with many cousins and friends. She is preceded in death by a step-father Gary Hoerle. Family and friends are invited to call on Saturday May 11th from 1-2pm at the New Testament Church 7080 Standpipe Rd. in Perry where a Celebration of Colleen’s life will be held at 2:00 pm. A luncheon will immediately follow the service at the church. Memorial contributions may be made to the Home Care and Hospice of Wyoming County 450 N. Main St. Warsaw, NY 14569. To send flowers or a remembrance gift to the family of Colleen M. Falgiano, please visit our Tribute Store. Guaranteed delivery before Colleen's visitation begins. Guaranteed delivery before Colleen's celebration of life begins. "Email Address" would like to share the life celebration of Colleen M. Falgiano. Click on the "link" to go to share a favorite memory or leave a condolence message for the family.